Huddle room deployment is akin to copying and pasting the same information from space to space, said David Shamir of Atlona. They’re everywhere! Or at least, everybody seems to want one, or a few, or a lot. 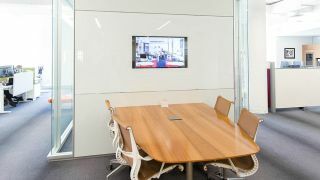 But huddle rooms, by definition, are pretty low-key when it comes to technology; therefore, they can’t command the same level of design fees that AV integrators apply to more sophisticated meeting spaces. Still, clients want to huddle, and if you don’t provide them the means to do so, someone else will. The question is: how do AV integration firms make these projects profitable? It’s a somewhat tricky question because in many cases, large enterprises don’t enlist integrators to install huddle room equipment. “Huddle technology very often—not always, but in its simplest, most basic form—is installed by the internal IT guys, and telephony guys, and smart people who are not experts in collaboration and AV, but [who] know very well how to install technology devices,” said Ira Weinstein, senior analyst and partner at Wainhouse Research, a unified communications and collaboration market research firm. These organizations may purchase their huddle room tech from AV integrators, but the buck stops there. David Shamir, Atlona Happily, not all companies wish to burden their internal IT staff with huddle room installations, and this is where Weinstein counsels AV integrators to adopt a deployment method based on volume and efficiency. “[With huddle rooms,] you’re done in an hour,” he said, especially if you’re rolling them out in the same building. If you can do, say, six a day, the cost of integrating one room is a lot lower than if you’re installing them piecemeal. This may sound like a fast-food approach to AV integration—something many firms shy away from—but Weinstein argues that these installations will lead to more complex projects down the road. “Once you recognize that, you just turn the crank and do as many as you can for as many clients [as you can] because if they need you for those rooms, they’re going to need you for the next type of room, which is a little more complicated—and the room above that, which is a little more complicated,” he said. The term “trusted partner” may be overused, but it applies well to this scenario. While AV/IT convergence is no longer news, there are still glitches in the system, and David Danto, director of emerging technology at IMCCA, observes that this is due to history: AV and IT followed different evolutionary paths.